Loving Angels Care provides experienced personnel to all types of care services. For over 4 years we have worked closely with care homes, home care providers and private organisations throughout the U.K to develop a staffing service which fully meets the needs of a busy care environment. By listening carefully to both staff and employer we ensure that our staff are placed in assignments to which they are ideally suited. This allows Loving Angels staff to enjoy their work, while our clients benefit from care agency personnel with the skills and aptitudes needed for the particular circumstances of care. Through this attention to detail, Loving Angels has become one of the UK's most respected care staff agencies. Our staffing solutions run 24 hours a day 7 days per week. Whether you book staff a week in advance or need last minute shift covers, our team will ensure we do everything we can to meet your needs. As a client what can I expect from a Loving Angels carer? Loving Angels Care staff have a reputation for the highest standards of care and reliability. Our carers only accept shifts they can fulfil. Our staff are punctual, conscientious and dependable. Our staff are highly skilled and have completed all mandatory training meaning no matter what role you need them to undertake on an assignment, they will get the job done to a high standard. 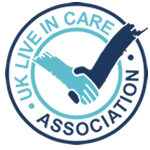 Loving Angels Care is fully compliant with The Health and Social Care Act 2008, and is registered with the Care Quality Commission. During our most recent inspection in February 2018, we were rated good across all key lines of enquiry. To see our most recent report, please visit www.cqc.org.uk. Loving Angels Care is also a registered body with the Disclosure and Barring Service (DBS). We remain fully compliant with all relevant regulations and guidelines. All staff we supply have an enhanced DBS clearance, and written staff profiles are available in advance for all our personnel. As a client of Loving Angels Care, you will have a dedicated account manager who will be your point of contact on a day-to-day basis. We also have a 24 hour on call line which can be used for emergency shift covers and another queries you may have outside our office hours of 8am - 8pm Monday to Friday.